You know the leftovers? Maybe you poured out too much acrylic paint and you are left with a small pile of drying paint when you finish your project. Or perhaps you were sculpting with Apoxie Sculpt and you mixed too much? Wigging or costuming a doll creates a lot of leftovers! Doll costuming starts with small pieces to begin with, so by the time you are through the scraps are so tiny—maybe a few centimeters. If you are like me, you feel guilty throwing away even the smallest bits of paint, paper or fiber. Here is my solution. Keep several empty canvases on hand. Even if you aren’t a painter. When you have excess paint, lay it down on the canvases—have several started at once so you can coordinate or play with colors. If you want, keep one canvas for each color you like to work with. Here you can see I have a few random colors started. Working on these mini projects creates a nice break from the current project you may be laboring over and it provides a few moments to play without reservation. Create without plans—just throw the paint down—play with patterns, textures and color blends. Explore new styles you might not normally attempt. It’s okay—it’s just the scraps! And you might end up creating something you really enjoy! Or something you can sell! Or something you can gift to an unsuspecting friend or distant relative ;]. Here is how to add some dimensional fun! When you have excess fiber scraps, lay them down on the canvas. 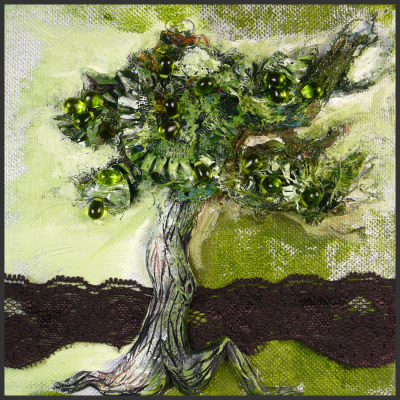 Here I have created a tree using left over Apoxie Sculpt (trunk) and bits of fiber in several colors and textures. I used Gel Medium to secure the pieces both on top and the bottom. This is a great use for the gel medium that gets dried and rubbery around the top of the container (mmm.. leftovers!). Add paint over top and voila! Everything is pulled together. The shinies are a few glass drop beads left over from a project. This tree is probably not finished, but you get the idea! Use excess paint in your art journal if you have one—perfect for creating backgrounds! Use fibers to make a dimensional ocean or body of water on your collage. In the spring time, put thread or fibers out for the birds to build their nests. Do you have a crafty child in your life? Save bits of fibers and fabrics in a small box to give to them. One of the greatest gifts I received as a child was a basket of craft supplies and materials.Thanks Mom! What do you do with your leftovers? I would love to hear it! Newer PostWhat Size Wig Does this Doll Wear? And What About Shoe Sizes?